When a demon prince kidnaps her best friend, twenty-two-year-old Sarah Croshen must fulfill a destiny she never asked for, to be unveiled and become a Supreme with supernatural abilities, or risk her friend’s life. "In The Last Innocent, Sarah Croshen discovers that she hasn't been imagining the strange phenomena that happen around her. She is a veiled Supreme, with supernatural abilities, and for years demons have been coming after her while her immortal guardians fend them off. Now that she knows the truth, things get even more complicated. And dangerous. The Last Innocent is exciting, and its take on angel and demon lore is interesting, especially the demi-demons and their daily influence on man. The characters are well-drawn. The good guys are brave and self-sacrificing without being too perfect. The villain is terrifyingly charming. Other characters lie in fascinating shades of gray. Sarah, our heroine, is strong and a little sassy, and her wit acts as a perfect balance for the weight of the problems she faces. 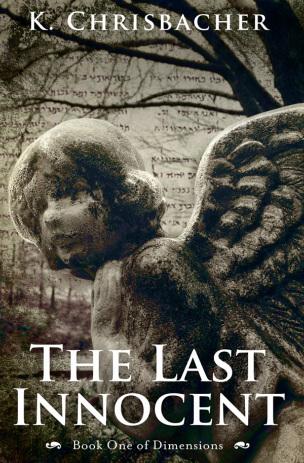 The Last Innocent teems with inner struggles, searches for identity, and forbidden love. K. Chrisbacher's skillful writing lets us experience all the tension and uncertainty right along with the characters, and the edge-of-your-seat final conflict will leave you wanting more." "Although I'm more of a fan of creative non-fiction, I'm also a fan of learning whether it's through the author's style or content. As K. Chrisbacher's story unfolded, it wrapped me up into a novel laced with mystery, action, fantasy, and a creative interpretation from the Book of Revelations. It even contained the dreaded romance I try to avoid reading. But Chrisbacher tells the story of Sarah Croshen quite well. I study books one page at a time and never try and guess what's coming next. The Last Innocent is written in such a descriptive style it absorbed me into the story. I take this journey along with Sarah as she discovers she isn't the typical college student she believes herself to be, and indeed has a higher calling. We see the characters with their heroic traits and especially their flaws. This work definitely spares us from the “perfect” characters that make most novels unbelievable. Open TLI and experience the adventure for yourself." "Good versus evil. Angels versus demons. Love and lust. Fear and greed. All are powerful ingredients for K. Chrisbacher’s latest novel, The Last Innocent. Not being an urban fantasy fan, I had been skeptical about this latest choice of reads until the second page. Then this author had me “in her pocket,” so to speak. What I found profoundly interesting was Ms. Chrisbacher’s incredible imagination, as well as her use of both senses and her insightful storytelling ability. I have to admit I also fell totally in love with a main protagonist, David, a Warrior angel who has either the fortune or misfortune of falling in love with a human—or so she believes. This is not only a story that deserves to be read and enjoyed. It is a novel that deserves five stars." Recipient of the Eliza A. Drew Award for Best Short Story, "Emil"